Ice cream is everybody’s all-time favorite comfort food. That is why it is frustrating whenever you crave for it and you cannot do anything about it. What if you are too busy to stop by the supermarket or convenience store? Worse, what if you are facing a certain health condition or undergoing a diet plan that only allows you to eat healthy desserts? Let’s face it; ice cream made with nutritious ingredients like fresh fruits and pure milk is hard to find in stores. If you do find one, how can you be so sure that the label’s claims are authentic? To solve all of these problems (admit it, you experienced some of them), we are here to give you the best ice cream maker in today’s market based on careful research and product testing. 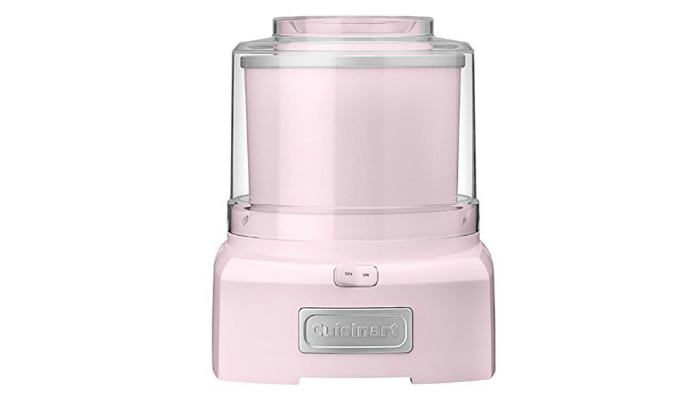 Cuisinart Frozen Yogurt, Sorbet & Ice Cream Maker has a heavy-duty motor that enables it to create cold desserts in just 20 minutes. It does not require ice anymore because of its double-insulated freezer bowl. When it comes to adding other ingredients without making a mess, this ice cream maker has a big spout and an easy-lock lid. The best part? It can also make sorbet and frozen yogurt whenever you prefer. It is like three appliances in just one product. 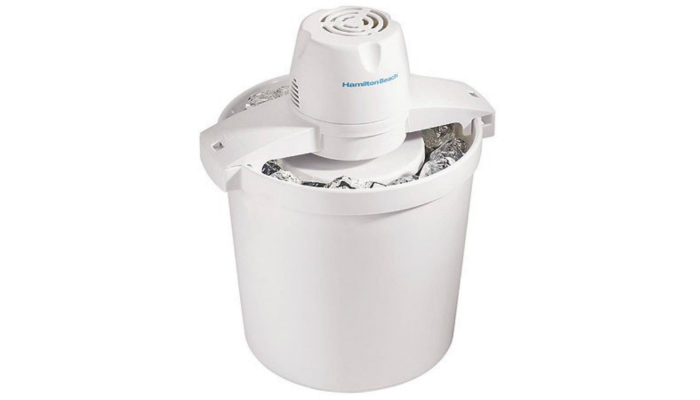 Hamilton Beach 68330N 4-Quart Automatic Ice Cream Maker will never require you to stir the mixture manually since its functions are all automatic. Aside from ice cream, it can also make gelato, sherbet, and custard. It comes with 20 recipes to indulge your sweet tooth. 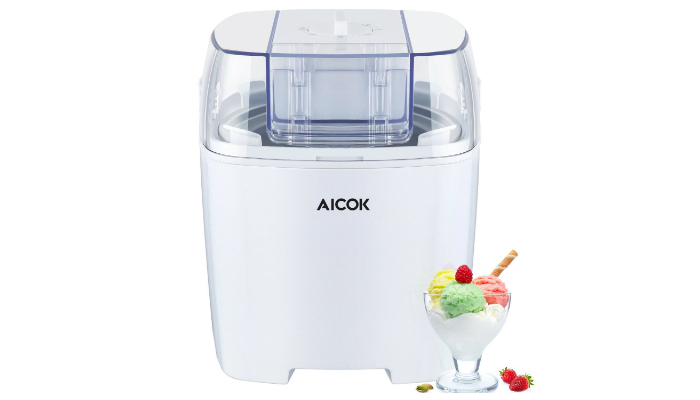 Aicok Automatic Frozen Yoghurt, Sorbet and Ice Cream Maker has six preset timers that are programmed depending on chosen flavors. You can leave this machine any time after adding the ingredients and setting the timer. You can also set the process longer if you want a colder dessert. This ice cream maker uses a special bowl that quickly freezes the mixture. Its lid and mixing arm are both detachable for thorough cleaning. 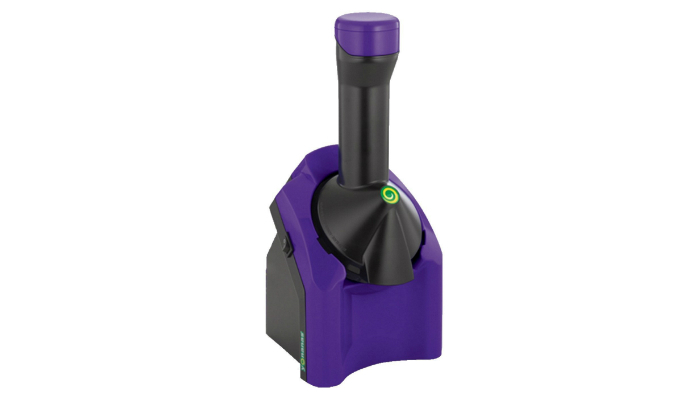 Yonanas Frozen Healthy Dessert 100% Fruit Soft-Serve Maker is ideal for people who want their ice cream to be different than the thick-creamy standard. It provides smooth or soft-serve ice cream. It ensures a perfect blend of solid ingredients like mango, berries, bananas, and even chocolate chunks. This unique ice cream maker lets you create a cold dessert just by churning frozen fruits without using preservatives, sugar, and fat. It can also be used for making pies, bonbons, and cakes. 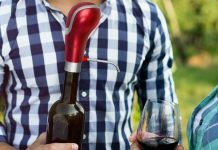 Its blade, plunger, and chute are all dishwasher-safe. Gourmia Automatic Digital Timer Easy Pour Spout Frozen Yogurt, Sorbet & Ice Cream Maker has a catchy LCD display for easier monitoring of time. You can easily add sprinkles, nuts, and chocolate chips through its easy pour spout. Nostalgia ICMP400BLUE 4-Quart Easy Carry Handle Electric Ice Cream Maker has a see-through lid for easier monitoring during the process as well as storage in the freezer. Unlike most containers, this one has a handle so you can carry it around easily. It is made of plastic, but it is safe to use since it is BPA-free. There are three main kinds of ice cream makers: freezer bowl, built-in freezer, and traditional bucket. 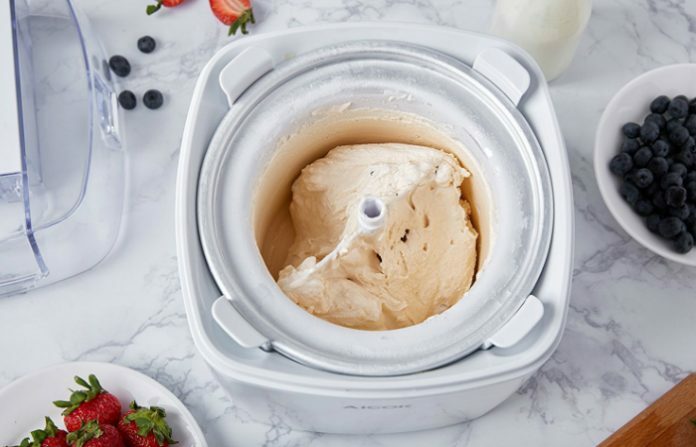 Ice cream makers using a freezer bowl are affordable. They have two major parts: the insulated freezing bowl and the motorized mixer. Insulated freezing bowls need to be chilled prior to the process. Meanwhile, the motorized mixer is the modern version of the old-fashioned paddle. It churns the mixture continuously to form ice cream. Unfortunately, freezer bowl machines are not recommended for surprise guests and homes with small freezers. You need to reserve 12 to 24 hours before the process so you can freeze the bowl first. The bowl also takes a lot of space. But, as soon as the bowl is perfectly chilled, just put the mixture there and turn on the machine. On the other hand, ice cream makers with a built-in freezer are much faster than freezer bowl machines. They literally create instant ice cream. Regarding their parts, they basically have a compressor that looks like a mini freezer. This component ensures achieving the right temperature in just a few minutes. Built-in freezer machines are also versatile. 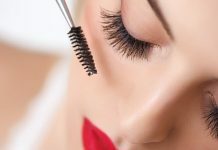 Most of them can be adjusted based on your desired texture. They are perfect for people who love to experiment flavors. The downside of owning this type of ice cream maker is shelling out more money. Built-in freezers in ice cream machines obviously mean a higher price. Also, the total size of these machines is bigger, requiring more space on your kitchen counter. Lastly, we have the traditional type. Buckets are used by previous generations to make ice cream. They are still available in stores nowadays for people who prefer massive servings. Interestingly, they use rock salt and ice to freeze the mixture. 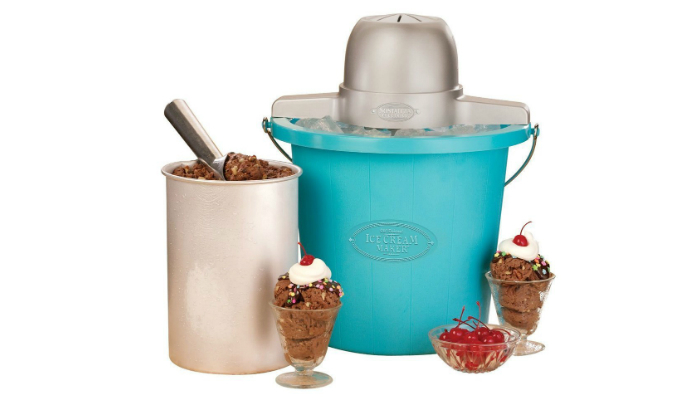 To meet the needs of the modern generation, instead of manual churning, most ice cream buckets already come with electronic mixers. What you still need to do manually is layering and replacing ice and salt from time to time. Just a heads-up, the whole process can be so messy. When it comes to the ice cream maker’s machine, the two factors you need to think about are size and design. Make sure that the machine does not take up too much space on your kitchen counter. If it is too big, you will face the hassle of packing and storing the ice cream maker all over again. An extra initiative is to evaluate a product based on its design. You may consider how the machine looks in your kitchen. The dominant factor here is color. One crucial thing to remember about ice cream machines is that a big bowl does not necessarily mean it has a large serving size. In fact, the volume of ice cream changes as the churner moves. What you need to check is the serving size of each product. 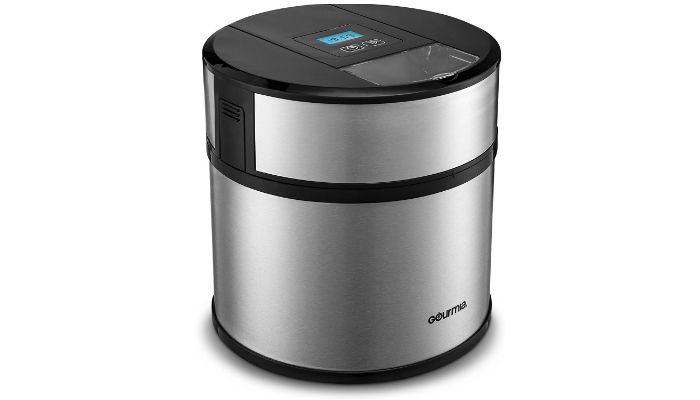 We selected Cuisinart Frozen Yogurt, Sorbet & Ice Cream Maker as the best ice cream maker for most people. Even if it only uses a freezer bowl, it will only take less than 30 minutes to complete the procedure. Sure, ice cream makers with built-in freezers are faster, but our top pick here is much more affordable. In choosing the best ice cream maker for your own preferences, prioritize the type you want. Then, proceed to consider the machine’s size and color. Lastly, remember that serving size determines the amount of ice cream – not the bowl’s size. For other kitchen appliances that can instantly make your favorite comfort foods, check out our take on the best machines for making quesadillas, breakfast sandwiches, and Belgian waffles.